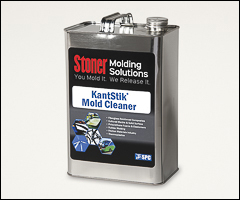 Mold cleaners, mold sealers, KantStik sealers, KantStik mold cleaners. Release agents are available on the Misc. release agents , Paste wax , and Semi-permanent releases pages. A special blend of solvents designed to dissolve and to remove most release agents and resin buildup from molds without dulling the surface. Ideal for preparing polyester mold surfaces for the application of any KantStik mold release agents. Also excellent to use for cleaning brushes and equipment. WARNING: Proposition 65 Label for mold cleaners . Used to fill and cover porosity. Prepares the mold for release agent.Effectively seals pores on new or reconditioned tooling. Made from a combination of polmeric type products. Imparts a hard, new glossy surface coating on tooling molds, therefore improving your finished parts. KantStik sealer is recommended as a basecoat on tooling molds, used prior to the application of KantStik SPC 1.0.